The Indian state of Punjab has two growing seasons: one from May to September and another from November to April. In November, farmers in Punjab typically sow crops such as wheat and vegetables. They often set fire to their fields to clear them before planting, a practice known as stubble burning. 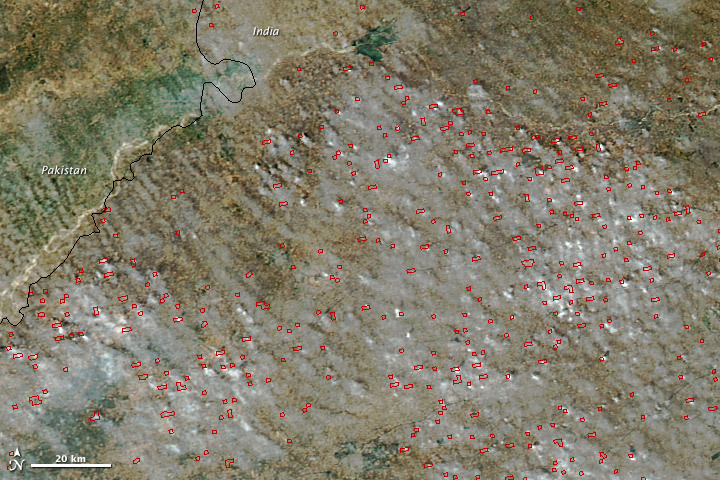 When the Moderate Resolution Imaging Spectroradiometer (MODIS) on NASA’s Aqua satellite passed over the region on November 12, 2013, numerous such fires were burning. In the image above, red outlines show the approximate locations of active burning. Fields generally appear brown. See the lower image for a closer view of the fires. 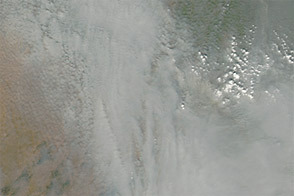 Although the smoke appeared to originate primarily from the agricultural fires, other factors such as urban and industrial smog may have contributed. According to a study published in Environmental Pollution, Punjab farmers most often burn stubble from rice plants in November. 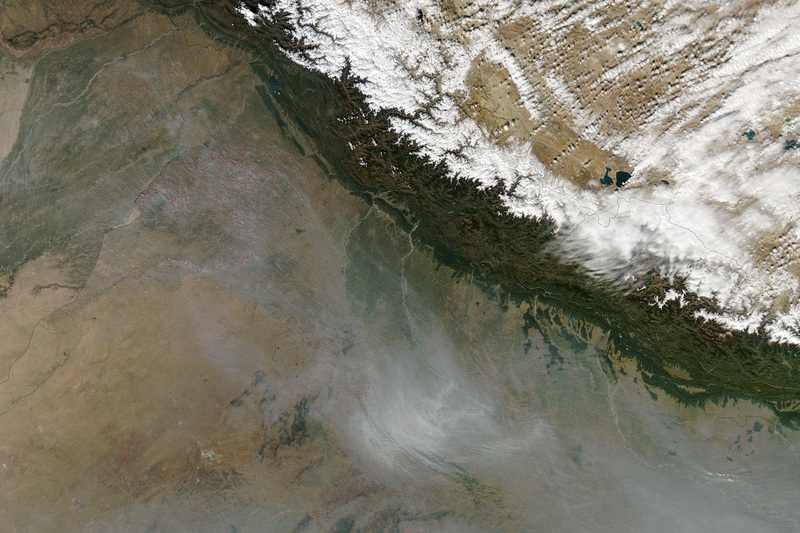 A smoke plume extended far to the southeast, obscuring the satellite’s view of cities in Uttar Pradesh such as Lucknow and Kanpur. Smoke from agricultural burning contains numerous substances that can harm human health, including carbon monoxide, nitrogen oxides, and particulate matter. On November 9, 2013, the Times of India reported that smoke was heavy enough in Chandigarh to ground a handful of flights. In addition, engineers from the Indian Institute of Technology recently published a report noting that air pollution posed a threat to the Harmandir Sahib (Golden Temple), an historically-significant religious site in Amritsar. 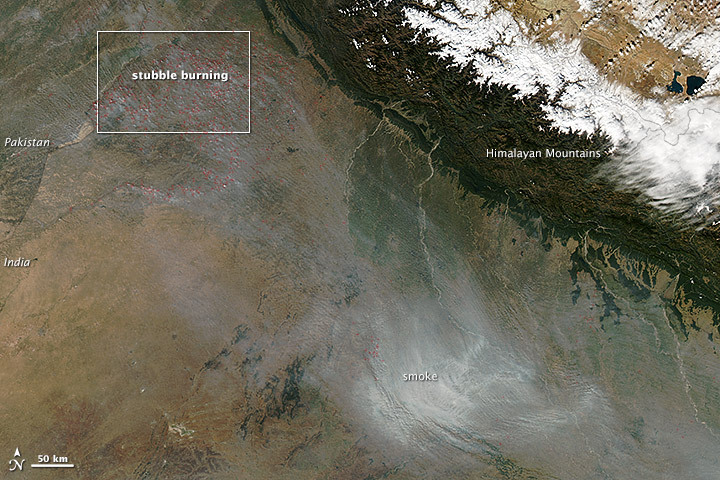 In November 2013, skies were smoky in northwestern India as farmers burned leftover crop residue. AirNow (2003, August) Air Quality Guide for Particle Pollution. Accessed November 15, 2013. Center for Educational Technologies (2002) Punjab’s Prosperity. Accessed November 15, 2013. Hindustan Times (2013, October 18) Lack of sowing machine makes drive against stubble burning futile. Accessed November 15, 2013. The Times of India (2013, November 9) Stubble trouble grounds flights. Accessed November 15, 2013. The Indian (2013, November 6) Health problems on the rise due to burning of paddy stubble. Accessed November 15, 2013.
Business Standard (2013, November 10) It’s smokey in Punjab, Haryana as farmers burn paddy straw. Accessed November 15, 2013.